The John W. Goodwin Papers are ready for researchers. An updated finding aid and digitized selections from the collection are now available on DigitalCommons@ACU. John Goodwin began preaching in the Churches of Christ in 1948. Before he began preaching, he worked as sales manager for Holsum Baking Co., Corpus Christi, Texas. 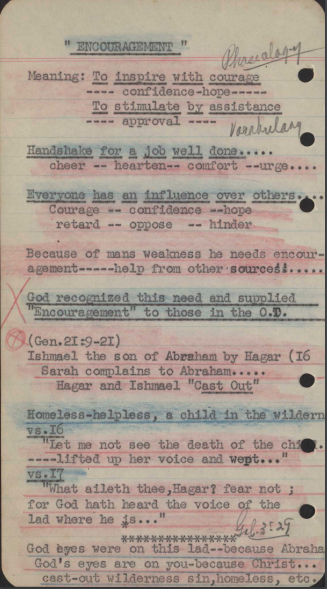 The collection contains the sermon notes and outlines of John W. Goodwin. The collection is housed in five boxes and one series. The Fifth & Beechwood Church of Christ Records are ready for researchers. An updated finding aid and digitized selections from the collection are now available on DigitalCommons@ACU. 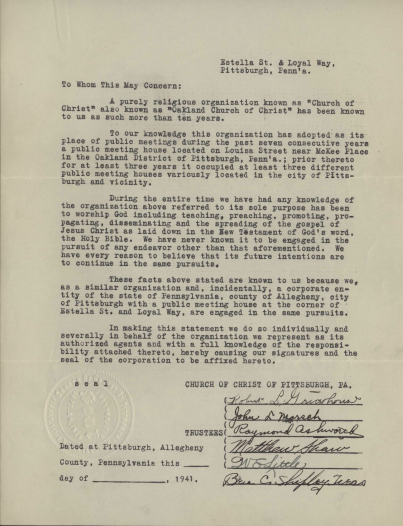 Notarized document from Trustees of the Church of Christ of Pittsburgh, Series II: Correspondence/Business, Fifth and Beechwood Church of Christ Records, 1931-1972. Center for Restoration Studies MS #7. Abilene Christian University Special Collections and Archives, Brown Library. Abilene Christian University, Abilene, TX. This record group contains correspondence giving insight into the churches in Pennsylvania and the northeast in the 20th century. The collection contains letters, legal documents, binders, a list of new converts, and papers concerning elder selection. 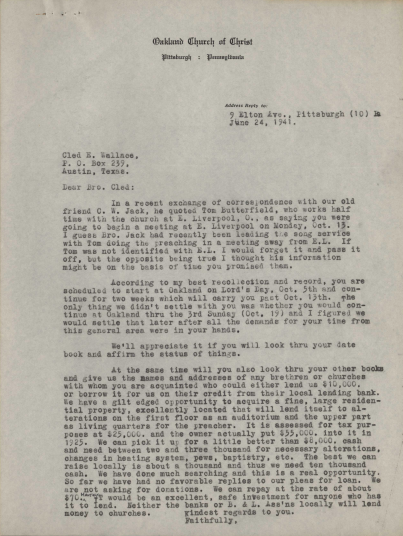 Letter from Oakland Church of Christ to Cled E. Wallace, Series II: Correspondence/Business, Fifth and Beechwood Church of Christ Records, 1931-1972. Center for Restoration Studies MS #7. Abilene Christian University Special Collections and Archives, Brown Library. Abilene Christian University, Abilene, TX. The Fifth and Beechwood Church of Christ was formerly known as the Oakland Church of Christ and is located in Pittsburgh, Pennsylvania. 56th Street Church of Christ, “56th Street Church of Christ (Philadelphia, PA) Collection, 1888-2016” (2018). 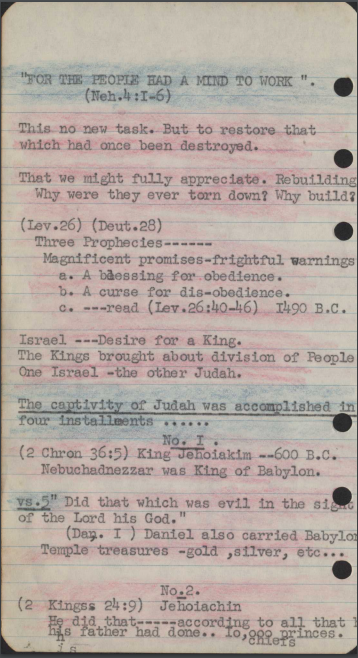 Center for Restoration Studies Archives, Manuscripts and Personal Papers Finding Aids. Kelton Church of Christ, “Kelton, Pennsylvania. Church of Christ Church Record Book 1838-1873.” (1873). Stone-Campbell Books. Vandivier, John (JW) W., “John W. (J.W.) Vandivier Collection, 1850-1927” (2018). 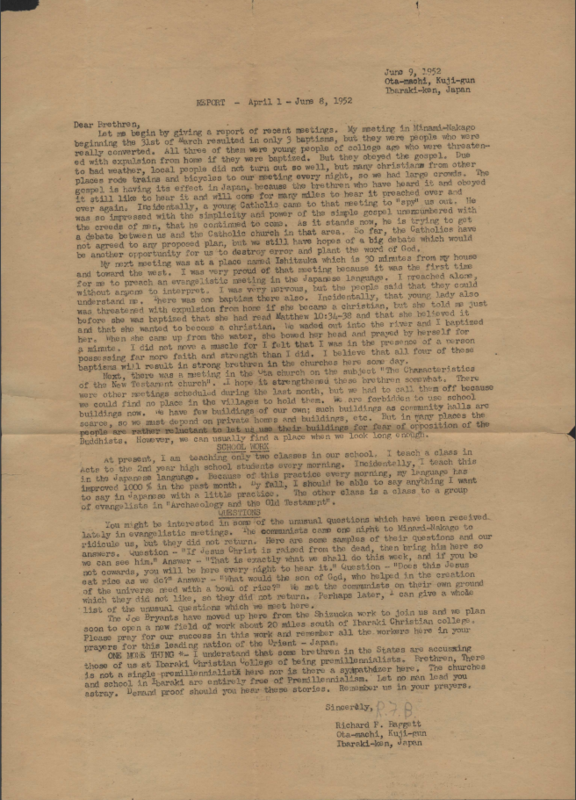 Center for Restoration Studies Archives, Manuscripts and Personal Papers Finding Aids. 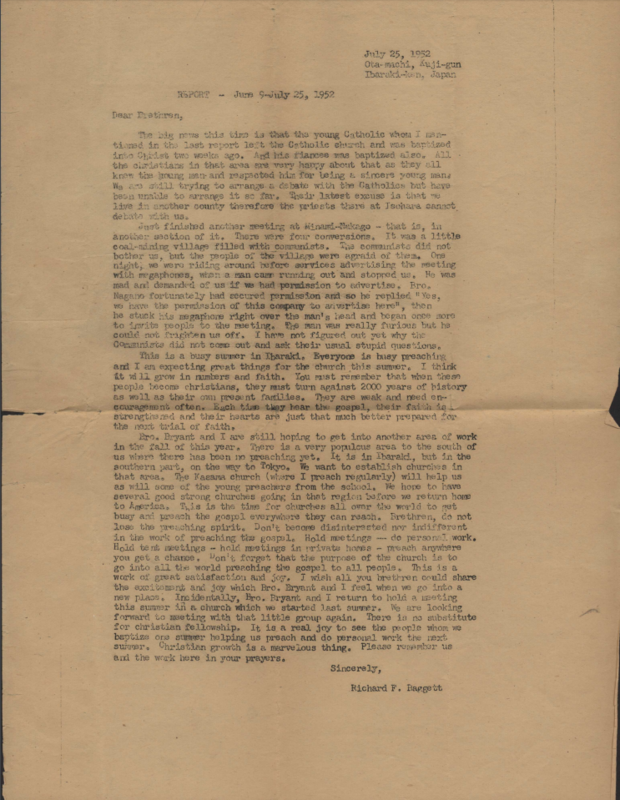 The Richard F. Baggett Papers are ready for researchers. An updated finding aid and digitized selections from the collection are now available on DigitalCommons@ACU. Report- April 1-June 8, 1952, folder 1, Richard F. Baggett Papers, 1952. Center for Restoration Studies MS #261. Abilene Christian University Special Collections and Archives, Brown Library. Abilene Christian University, Abilene, TX. Report- June 9-July 25, 1952, folder 1, Richard F. Baggett Papers, 1952. Center for Restoration Studies MS #261. Abilene Christian University Special Collections and Archives, Brown Library. Abilene Christian University, Abilene, TX. This collection includes two reports from Richard F. Baggett, an American who was serving as a Churches of Christ missionary in Japan. Baggett mentions preaching in Japanese for the first time without the assistance of an interpreter, describes gospel meetings, discusses the presence of communists, and addresses accusations that those operating Ibaraki Christian College were premillennialists. Baggett, Richard, “Presenting the Restoration” (1981). Lectureship and Summit Audio Collection. 4916. McMillan, E. W., “The Voice of Opportunity From China and Japan” (1948). Stone-Campbell Books. 332. Union Avenue Church of Christ, “The Story of a Church” (1946). Stone-Campbell Books. 449.